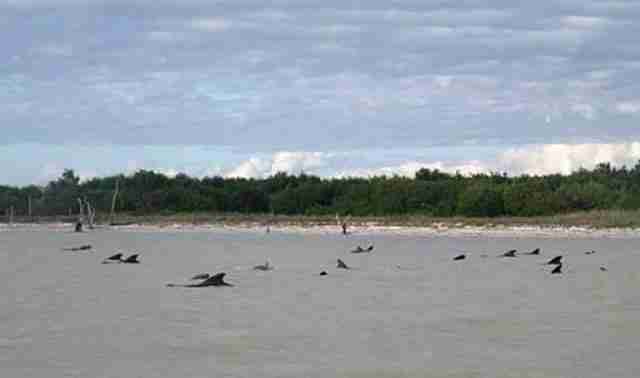 Authorities in Florida say that a pod of 20 to 30 45 51pilot whales have been stranded in shallow water after venturing into Everglades National Park since yesterday afternoon. Rescue workers are on the scene, attempting keep the whales alive as they "push" the animals back towards to open ocean. It's so shallow at low tide for such a long distance it makes it more difficult to get the whales to an area where they can swim away. It's not unusual for the whales to end up in the shallow waters, which stretch for hundreds of yards. The thing about these whales, as the day heats up they'll have to keep them wet. Sadly, four whales have died so far from exposure after beaching. UPDATE II: The Associated Press is now reporting that ten of the whales have passed. What makes this situation so challenging, is that the area where the whales are beached is very remote and takes more than an hour to reach and officials do not have access to heavy machinery that could assist in moving the whales into deeper water. Unfortunately, Blair Mase, a marine mammal scientist with the National Oceanic and Atmospheric Administration (NOAA) tells CNN that, "expectations are low" for the remaining whales. UPDATE III: Thursday, Dec. 5 - Workers reportedly stopped working after work last night, but returned early this morning to check on the status of the whales. Liz Stratton, assistant stranding coordinator for the National Oceanic and Atmospheric Administration, tells the Associated Press, "We're going to be cautiously optimistic on our way out. We don't know what we're going to find." UPDATE IV: NOAA Fish Southeast is live-tweeting from the scene with some good news. "Objectives today if live animals are located - attempt to herd live animals to deeper water, sample dead whales." As of this morning USCG has confirmed 10-15 live whales swimming north of where they were yesterday. Encouraging that remaining whales have not been seen. Hopes they have gotten back to deeper waters. 10-15 whales spotted by USCG helo. Some of other (approx. 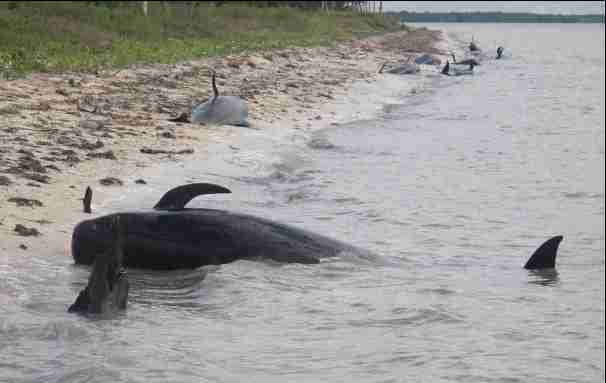 30) whales may have gone offshore. Rescuers from agencies including the National Park Service and the Coast Guard positioned their boats to corral the whales and used sound vibrations from aluminum pipes to drive them away from the shore, said Blair Mase, coordinator of the National Oceanic and Atmospheric Administration's marine mammal stranding network. Using these "gentle herding" techniques, scientists were able to get the 35 whales into 18-foot-deep water about 6 miles offshore. Happy with the progress, most of the rescuers returned to shore midafternoon Thursday. "We are cautiously optimistic," Mase said. "Even though we are hopeful, this situation can go either way."